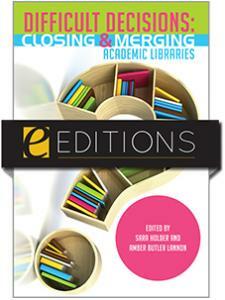 This publication explores all of these aspects of library consolidation through commentary, research, and case studies written by librarians with experience navigating these events. Individual chapters address either the entire process of a consolidation or closure, multiple aspects of one or more experiences, or one aspect that is particularly important such as communicating with faculty or using data to make decisions about collections. 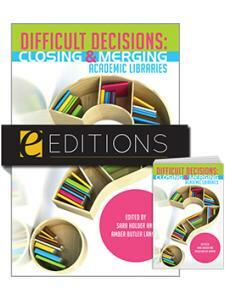 Difficult Decisions: Closing And Merging Academic Libraries is a comprehensive resource for library administrators faced with making these decisions, librarians asked to assist with these challenging projects, and anyone working in a library undergoing a merger. Difficult Decisions: Closing And Merging Academic Libraries is appropriate for all types of academic libraries as well as for schools of library and information science. Chapter 6. Change in the 21st-Century Library: Fate or Opportunity? Amber Butler Lannon is an associate librarian and head of the Humanities and Social Sciences Library at McGill University. She has coauthored several articles and book chapters on a variety of topics including e-book usage, library closures, library management, and dog therapy in libraries. She is an active member of the Academic Business Library Directors Group and a founding editor of Ticker: The Academic Business Librarianship Review. In addition to her MLIS from Dalhousie University, she has an MBA from the University of British Columbia. "For those librarians who will be dealing with these projects, this book provides valuable insights and useful, practical techniques."